2017 was a great year for Xiaomi. In October, the company exceeded the revenue goal of RMB 100 billion. Towards the end of the year, it also became the top smartphone vendor in India, the company’s biggest market outside of China. In its first launch event in 2018 in India, Xiaomi has announced two smartphones – Redmi Note 5 and Redmi Note 5 Pro. Let’s see what you need to know about the Xiaomi Redmi Note 5 and Redmi Note 5 Pro specs, features, price and availability. Watch our Xiaomi Redmi Note 5 and Redmi Note 5 Pro review video below, or check out the written Redmi Note 5 Pro review or Redmi Note 5 review! Launched last year, the Redmi Note 4 was the best-selling smartphone in India in 2017, and the Redmi Note 5 is a progressive update to the same. It’s the same smartphone at heart, just better. It packs in the same internals – the dependable Qualcomm Snapdragon 625 chipset – and comes in two memory variants – 3 GB + 32 GB and 4 GB + 64 GB. Xiaomi has done away with the base variant with 2 GB RAM that was part of the portfolio last year. The Redmi Note 5 Pro is made for those who need a little extra on the spec sheet. It marks the global debut of the Snapdragon 636 processor — Qualcomm’s latest 600-series chipset — and features the newest Kryo technology, which is typically only seen in 800-series chips. The Pro also comes with a 6 GB RAM variant, which is unheard of in this price segment. Both Redmi Note 5 and Redmi Note 5 Pro sport 5.99-inch Full HD+ display with 18:9 aspect ratios. The front of the devices have minimal bezels and look similar to some flagship devices out there. Compared to a traditional 5.5-inch display, Redmi Note 5/Pro ﬁts the same in your hand, while offering 12.5% more display area. Apart from the choice of processor, the primary difference between the two devices lies in the camera department. While the Redmi Note 5 packs a 12 MP rear camera with f/2.2 aperture, the Redmi Note 5 Pro comes with dual camera setup (12 MP + 5 MP) to offer portrait photography. The front camera on the Pro is a 20 MP Sony IMX376 sensor combines with Xiaomi’s Beautify 4.0 AI algorithm for some great selfies. The Redmi Note 5 and Redmi Note 5 Pro come with MIUI 9, the latest version of the company’s proprietary layer over Android. MIUI 9 is based on Android Nougat, which is disappointing to see in a smartphone launched in 2018. Although bloated, the MIUI is one of the better Android skins out there. There are nifty add-ons and customizations, especially for the Indian market, that a lot of power users appreciate. The Redmi Note 5 is priced at Rs. 9,999 (~ $156) for the 3 GB + 32 GB variant, and Rs. 11,999 (~ $187) for the 4 GB + 64 GB variant, available in Black, Gold, Rose Gold and the new Lake Blue. A case is bundled in the box. 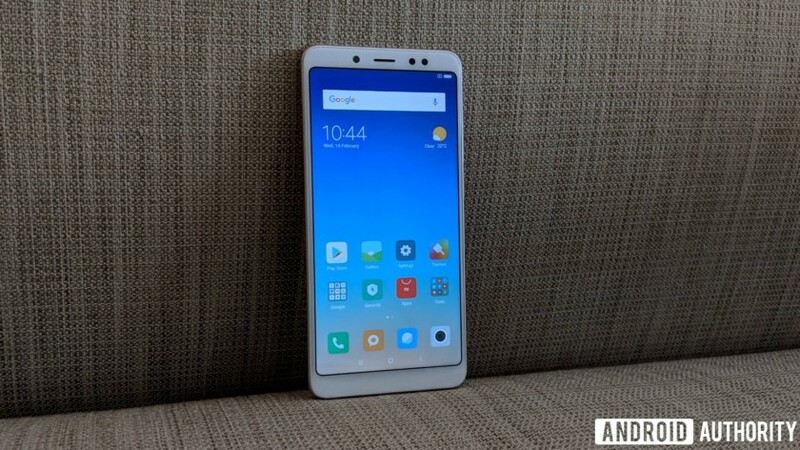 The Redmi Note 5 Pro will cost Rs. 13,999 for the 4GB version and Rs. 16,999 for the 6GB, and will be available in the same colors as the Redmi Note 5. In India, the Redmi Note 5 and Redmi Note 5 Pro will go on sale on Flipkart and Mi.com on February 22 at 12 noon. Post this, both smartphones will be made available every Wednesday. So, there’s the new Redmi Note 5 and Redmi Note 5 Pro in a nutshell. What are your thoughts so far? Are you buying either one? Let us know in the comments below!